In 1948, after surviving World War II by escaping Nazi-occupied France for refugee camps in Switzerland, the author's grandparents, Anna and Armand, bought an old stone house in a remote, picturesque village in the South of France. Five years later, Anna packed her bags and walked out on Armand, taking the typewriter and their children. Aside from one brief encounter, the two never saw or spoke to each other again, never remarried, and never revealed what had divided them forever. 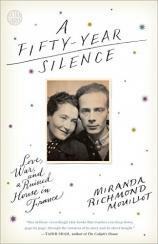 A FIFTY-YEAR SILENCE is the deeply involving account of Miranda Richmond Mouillot's journey to find out what happened between her grandmother, a physician, and her grandfather, an interpreter at the Nuremberg Trials, who refused to utter his wife's name aloud after she left him. To discover the roots of their embittered and entrenched silence, Miranda abandons her plans for the future and moves to their stone house, now a crumbling ruin; immerses herself in letters, archival materials, and secondary sources; and teases stories out of her reticent, and declining, grandparents. As she reconstructs how Anna and Armand braved overwhelming odds and how the knowledge her grandfather acquired at Nuremberg destroyed their relationship, Miranda wrestles with the legacy of trauma, the burden of history, and the complexities of memory. She also finds herself learning how not only to survive but to thrive --- making a home in the village and falling in love. With warmth, humor and rich, evocative details that bring her grandparents' outsize characters and their daily struggles vividly to life, A FIFTY-YEAR SILENCE is a heartbreaking, uplifting love story spanning two continents and three generations.